The John Black Room Library was added to the Saranac Laboratory in 1928. Historic Saranac Lake hosts temporary exhibits in the space and rents the room for public and private use. Download our Room Use Policy and Form or contact us with questions about renting the John Black Room. "...this room, wrought to the last detail with the loving care and fidelity of one of his dear friends, will be a center from which will go more appreciation of what the doctors are to Saranac Lake and of what Saranac Lake can be to the people who have tuberculosis.” -- Jessie Baxter Black, 1928. John Black's parents, Jessie and Frank Black built the John Black Room addition to the Saranac Laboratory as a memorial to their son and a tribute to the community that cared for him for five years. One perceptive visitor to the John Black Room remarked that the space “looks like Princeton.” Indeed, the stylistic similarities are no accident. The room was designed by the Princeton architect Robert McLaughlin, and the Black family had close ties to Princeton. Two of John’s younger brothers, Donald and Roger, followed him there. In the next generation, five of Frank and Jessie’s seven grandchildren attended Princeton. After John’s death, the Blacks dedicated a stained glass Tiffany window at the Princeton Chapel in his name. Other Princeton contemporaries of John Black who volunteered for service in France include writers F. Scott Fitzgerald, Edmund Wilson, and John Peale Bishop. 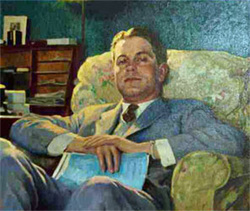 The portrait of John Black was painted from a photograph in 1928. Courtesy of the Trudeau Institute, the portrait has been returned to its original location above the fireplace in the John Black Room. After many years of restoration, Historic Saranac Lake reopened the John Black Room for use as a community meeting space. The second floor is now occupied by commercial office space. In 2008, HSL published a brochure on John Black and the John Black Memorial Room. The brochure is available at no charge through the office. View the John Black Brochure. John Black attended Andover Academy and Princeton. He planned to work at the Ohio Brass Company of which his father, Frank Blymyer Black, was founder and president. Then came the Great War, and in May of 1917, John Black sailed for France with the Princeton Unit to enter the American Field Service as a volunteer ambulance driver. Instead, he spent that summer on the Aisne front with the French camion service. In October of 1917, John joined the American army at Paris. He was sent to the French Artillery School and was in active service in France until returning home ill with tuber- culosis in May of 1918. Sent to Saranac Lake for the fresh air cure in July of 1918, John and his mother stayed in the village for five years, renting three different houses.